Michele Martin (The Bamboo Project) did her first screencast using Camtasia to create a video that shows new bloggers the evolution of a blog post from her reading an article in her feed reader, through posting her response to the article and the interactions that took place in comments on her blog and at the original post. But she was a little disappointed in the quality of the screencapture so I thought I would share some quick tips that will help. Camtasia Studio 3.1.3 – TechSmith are offering the full version of Camtasia Studio 3.1.3 for free download. Download a free copy of Camtasia Studio 3.1.3 here and request the free software key here (this will register your copy as a fully licensed version). CamStudio – Download a free copy of CamSudio here and check out my “how-to-use” CamStudio here. Jing – Download a free copy of Jing here (Camtasia Studio and Jing are both products of TechSmith) and here is an example of a screencast I created using Jing. I normally use CamStudio because we don’t have licensed copies of Camtasia Studio at work — which means if I want to edit the screencast I have to use MovieMaker. Camtasia Studio means you can record and edit the screencast without having to use another program plus Camtasia Studio does more than just screencasts (e.g. create videos from PowerPoints and create digital stories). My first for creating a better screencast is the recording region. Recording the entire desktop is not an issue if you are creating a video from a PowerPoint because text is usually large (here is an example of a video podcast created by Richard Meagher from a PowerPoint and this is how he creates his video podcasts using Camtasia Studio). Video format you use to produce your screencast can have a big impact on final quality of the online video. The trouble is the most frustrating aspect of video is there is too many video formats. Some applications only provide limited options for saving your movie however Camtasia Studio gives you lots of options i.e. AVI video , MOV (QuickTime Movie), WMV (Windows Media video) and Flash (SLV/FLV format) so that you can choose the best option depending on how or what device you will be viewing it. 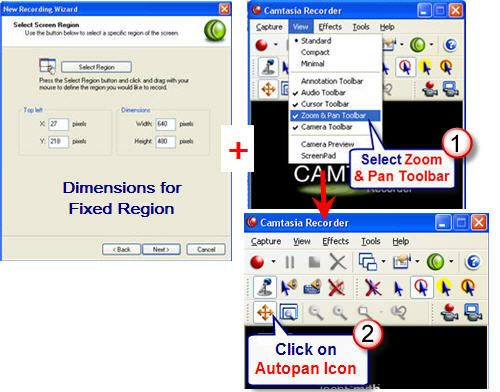 Below is my quick screencast that shows how to use fixed regions for creating a screencast which was produced as a .mov video compare this to the poorer quality of the same screencast produced as a .wmv video. With video is it always worth having a play with video format, remembering that you may not notice the difference between the formats until you upload to the video sharing website. For Camtasia Studio — I suggest probably best to stick to .mov format, using medium setting, when uploading to video sharing websites. Getting it right with video can be really frustrating! Format and options can drive you insane. I only had time to share a few tips, and I am not an expert with Camtasia Studio. Please add your tips for creating screencasts. Fantastic Sue and thanks! I violated both of your suggestions, instead recording the whole screen and converting to .avi for YouTube instead of .mov. Now I know what to do the next time. As always, you’re a lifesaver! Pingback: sooia » Blog Archive » Quick Tips For Improving Screencasts! and I voted for you too! Hi Michele – as I commented on your blog post .avi format is fine as it is not a compressed format. Hi Beth – thanks for including the link to your screencastprimer wiki I have added it to my new post on screencasting. (http://aquaculturepda.edublogs.org/2007/11/28/further-investigations-into-free-screencasts-software/) Thanks also for taking the time to vote.